An artist's loft is transformed with a unique treatment of existing soffits. From dark and crowded to spacious and breathtaking. ABA was tasked with removing a dark and poorly designed kitchen in a compact loft space, and to replace with an open, flexible and unique space that reflects the client's artistic style. Our solution was to merge a low, heavy soffit into the wall plane with plaster 'ribbons' to create a seamless transition. 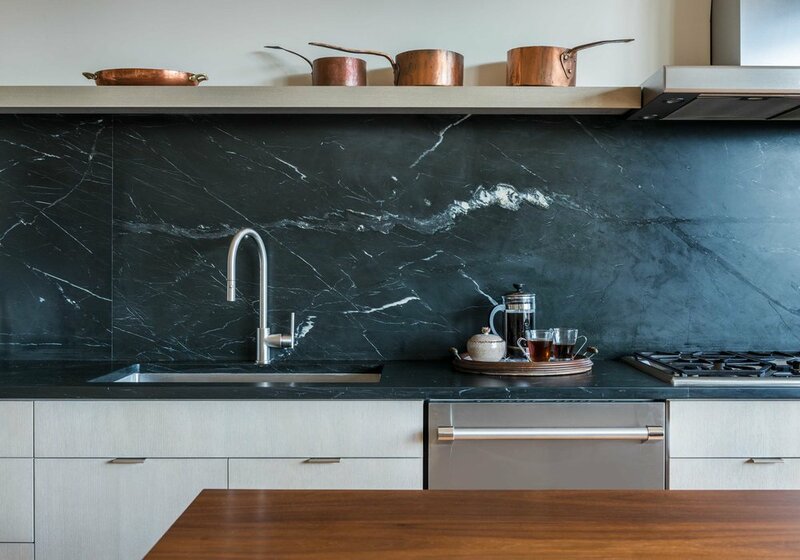 Paired with pantry towers and a statement backsplash made of soapstone, the result was a modern, subtle kitchen that fully integrates with the living space and creates a bright and open work environment. Additionally, the custom-fabricated walnut island doubles as a worktop for the client's art, and can be wheeled away to the wall to allow room for entertaining. Adjustable shelves in the reading nook have curves that subtly reflect the ceiling planes, and welcome you into the home. Small changes such as adding a cased opening at the entrance and installing stained-glass windows as transoms are also economical additions that help transform the space.